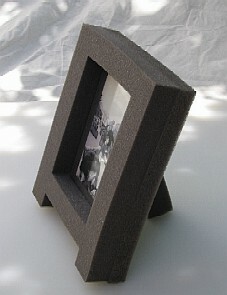 The frame was made from the foam nest that a replacement hard drive came packaged in. It was almost ready to reuse right out of the box. An extra piece of foam was cut to form a triangular prop that was glued to the back. The only other item required was a piece of glass to protect the photo. This simply was press-fit into place.